Ar Neamh Beag is a three bedroom property in West Cork with stunning views of Bantry Bay on the Sheep’s Head Peninsula providing self catering accommodation near the charming village of Kilcrohane in County Cork. This fabulous property is set on a large site surrounded by beautifully landscaped grounds and is tastefully decorated and well equipped throughout. West Cork is a magical part of Ireland and is one of the country’s most spectacular and well known holiday destinations. West Cork is one of the most beautiful parts of Ireland with an extensive coastline, gorgeous beaches and rugged landscape. There is always plenty to do in West Cork including, walking, golf, deep sea angling, diving and wind surfing. If you are feeling energetic there is a beautiful walk, the Sheep’s Head Way which is a wonderful walking trail where you can enjoy superb views of Bantry Bay and Dunmanus Bay. 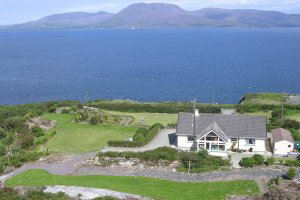 The house itself is a three-bed bungalow and fronts directly onto Bantry Bay, providing uninterrupted views of the sea from the front bedrooms, sitting room and dining room. There are 3 bedrooms, one of which is ensuite. All bedrooms are furnished with a double bed and wardrobe. This house has been prepared to make your vacation truly memorable – high end furnishings, fully equipped kitchen with microwave, two cookers, dishwasher, fridge, fridge-freezer, washing machine and dryer, CD/ Radio player, TV and DVD player. Towels are supplied free of charge. Pets permitted however only by prior arrangement with office. Please note this property only accepts weekly bookings. Follow signs for the ‘End of Sheep’s Head Drive’ (the road opposite West Lodge Hotel). Continue for 9.5 km keeping right when you approach a ‘Y’ junction. The property is a further 6.5km on the left side of the road and is marked by a name plate ‘Ar Neamh Beag’.